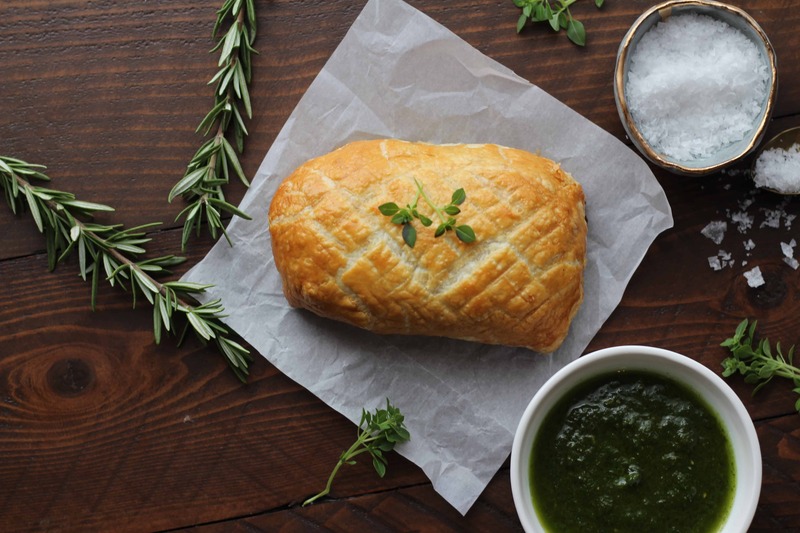 Beef Wellington has become closely tied to MasterChef and Gordon Ramsay. 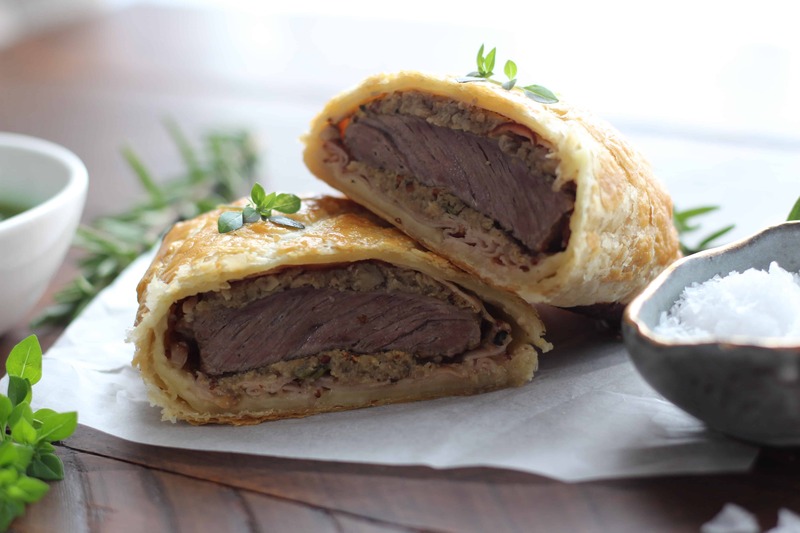 I’ve created my own Beef Wellington Recipe using Crescent Foods All Natural Angus Beef. 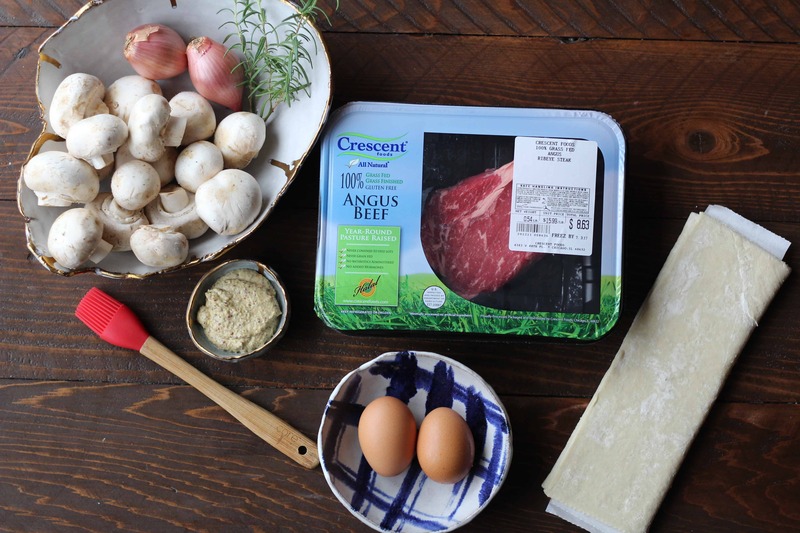 I love using Crescent Foods, free range, grass fed and finished beef! All Crescent Foods products are humanely treated and hand harvested Halal. The all natural beef, means five times more minerals and vitamins. It is also antibiotic and hormone free. This dish takes a bit of work, but it is definitely worth the effort! The combination of flavors, wrapped in a flaky, slightly-sweet pastry is so delicious. I made brussel sprouts and mashed potatoes for side dishes, but any roasted vegetable would make a great addition! You can find Crescent Foods at select Walmart and Kroger locations nationwide. You can get all your ingredients in one place! Check https://crescentfoods.com/where-to-buy/ for a location near you. Prepare the Mushroom Duxelles in a food processor. Pulse together the mushrooms, shallots and rosemary, until fine. Heat a skillet on medium heat and sauté the mushrooms until the mushrooms release their moisture. Set aside the mushroom to cool. Brush the two pieces of ribeye with dijon. On your work surface, lay out two large pieces of plastic wrap. Lay 3 slices of turkey and spread half the mushroom puree on top of the turkey on each sheet of plastic. Place the ribeye on the turkey and roll it up in the plastic. Place in the refrigerator to cool. Cut puff pastry in two. Remove the meat from the plastic wrap and place on the puff pastry. Brush with the egg yolk and fold the pastry around the meat. Score the top of the pastry and brush the outside with the egg yolk. Place the pastry on a baking sheet and bake for 25 minutes. Make this recipe? I’d love to see! Tag me using #CreateAmandasPlate!